The Price is nice tho, $19.95!! 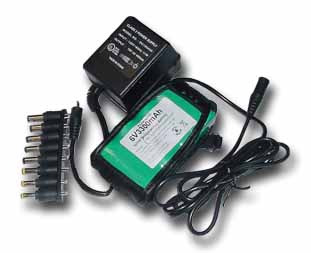 The top battery in this thread is the power runner 2200, which has a capacity of 3.2A-hr @ 5v. The power runner 2300 has a capacity of 7.2A-hr @ 5v. More than twice the capacity/runtime, for a little less than twice as much, $90. I'd imagine the 2200 would run the JB3 for about 6 hrs, probably get about 12-14 hours out of the 2300 (not that I've tried either). It just so happened that I was in the market for a external power supply for the JB3 when this post came up. So I went ahead and ordered the top one and hoped for the best. The company shipped it very quickly via UPS. I charged it up which took about three hours. It has a really nice 4 light LED power meter on it. I really like the fact that it came with a car adapter for charging on the go . As for run time for the unit I have been running my DA-P1 into the JB3 and so far I have gotten about 7 and a half hours out of it. It is finally on the last light on the meter so Im assuming you cant push it much farther. I would say this is a worthwhile investment, could be good for the festies especially if you charge it from your car in the morning. It is also super light weight so it would also be a small burden for those wishing to tape a little more discretely than usuall. Also +T for the thread..
Just placed an order for the 2300. I run some tests if others are interested once I get it. Well, out of the box, the 2300 isn't working. It shipps charged, but I am getting no power to the JB3....Sad! Hmm, crappy. Have you double-checked the obvious -- 2300 set to 5v, correct polarity on the adapter tip going to the jb3, etc.? Yep. Even tried the 4.5 setting just to check. Polarity, I believe I have it right, TIP > + 9 (so the + on the tip matches with the + on the plug.).. Sounds right. If you have access to a voltmeter you could check to be sure you're getting +5v out of the cable/tip. Otherwise, I'm out of suggestions. OK, I tested with a multimeter, and I appear to be getting nothing. I'm not really good with the advanced electronic stuff, so I basically tested the plug in from the wall for the JB3 and got a response, and then did it with the battery and got minimal to no repsonse on the multimeter. I have the battery plugged in for charging now, but all the lights are on making me think it is already charged. I'll check again in a few hours, and if I still have nothing, I will be sending this back. Double check that you've got the power tip inserted the right way to start off, first plug the cable into the battery, then plug the battery into the jb3, and then turn on the jb3. Oh, also, before you start any of this, use the continuity setting on the multimeter to be sure that there are no shorts in the cable between power and ground (or if you don't have a continuity setting, just use the resistance setting -- if you have 0 ohm of resistance, then you have a short in the cable). Also, it is probably best on your initial testing to remove the internal batteries from the jb3. The memorex/wallyworld li-ion batteries have protection circuits built into them. When they are short circuited, and perhaps when they are hooked up backwards to equipment, the protection circuit shuts off the output of the battery. (The protection circuit would almost certainly kick in if you had the tip inserted backwards to begin with and had batteries in the jukebox to start, since the jb3 batteries might be applying an opposite charge to the external battery.) From what I can tell from my memorex one, when this happens, the only way to get it to turn off the protection circuit and return to normal is to hook it up to the charger. The moment it is hooked up to the charger, it goes back to normal and all the charge it had before is available. Since you were getting nothing from the battery on the voltmeter, this makes me think that this is what happened to you. Otherwise, you should have been getting some low level of voltage reading on the output. And that would explain the deal with all the lights -- it would go from essentially 0 charge (or really 0 voltage due to the protection circuit) to fully charged as soon as it was plugged into the charger. Hopefully, this was the problem and the battery will turn out to work fine with the jb3.